Azerbaijan is simply copying Turkey’s sinister behavior that until recently wooed Jewish organizations in the United States and Israel’s government to block the passage of a congressional resolution recognizing the Armenian Genocide. Many Jewish groups ended their immoral cooperation with Turkey, after Turkish President Rejep Tayyip Erdogan began making anti-Semitic statements and threatening Israel. Furthermore, Azerbaijan’s pro-Jewish efforts are based on the fact that it purchases billions of dollars of modern weapons from Israel. In return, Azerbaijan sells a large amount of oil to Israel. There have been also intelligence reports that Azerbaijan has provided Israel with several bases on its border with Iran, should Israel decide to attack Iran’s nuclear facilities. The latest example of the collaboration between American Jewish leaders and Azerbaijan is the visit to Baku on March 3-8 by a group of U.S. evangelical pastors led by New York-based Orthodox Rabbi Marc Schneier “to promote interfaith dialogue and highlight cooperation with Israel,” according to the Associated Press. This was the first ever evangelical delegation to visit the Muslim Shiite nation. The Rabbi described Azerbaijan as “the most beloved and respected Muslim country in the eyes of the Jewish American community,” reported Trend, an Azeri news agency. Schneier spoke at an event in the U.S. Congress last year celebrating the close friendship between Azerbaijan and Israel. The group of 12 U.S. evangelical pastors met Pres. Ilham Aliyev of Azerbaijan, the foreign minister, Muslim Sheikhs, local church leaders, and Israel’s ambassador. Rabbi Schneier told the Associated Press that Pres. Aliyev “announced during the delegation’s visit that the country’s first-ever Jewish cultural center would be built in Baku with Kosher dining options and a hotel to accommodate Jewish guests.” Schneier heads the Foundation for Ethnic Understanding based in New York and founded the Hampton Synagogue in Westhampton Beach, New York. As a sign of their cozy relationship, Azerbaijan’s national airline flies directly to Tel Aviv and Pres. 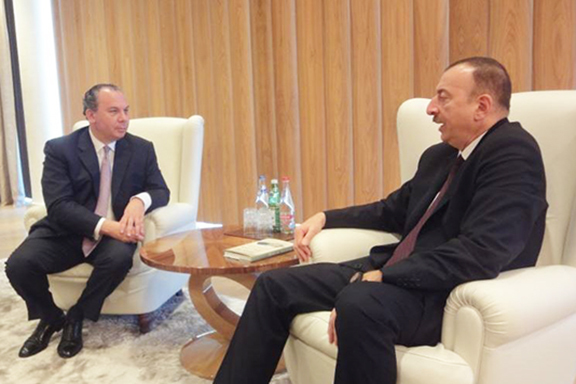 Aliyev hosted Israel’s prime minister in 2016. Rabbi Schneier’s visit to Azerbaijan last week was not his first. He has been there several times in recent years on propaganda tours. One wonders if the Rabbi has received any compensation from Pres. Aliyev for his ‘valuable’ services. His multiple trips to Azerbaijan makes the Rabbi look more like a lobbyist for Azerbaijan than a religious figure! I would urge Armenian evangelical church leaders to contact the 12 pastors who visited Baku last week in order to counter the propaganda they were fed against Armenia and Artsakh. I would also like to know if these pastors and Rabbi Schneier came back from Baku with suitcases full of the usual Azeri “gifts” of caviar, rugs, and other valuable items!